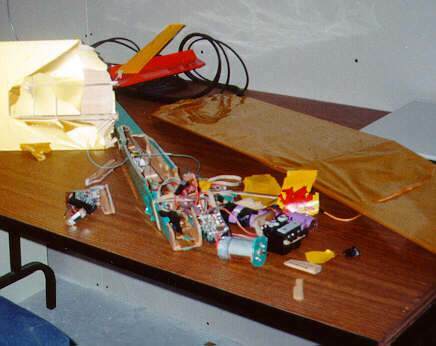 I’ve been interested in model airplanes since I was a little kid, and in 1992, I started building them in earnest. In 1994, I taught myself to fly. I currently (1997) have two flyable airplanes, and one pile of wreckage. All my airplanes are electric powered. No gooey fire-breathing noise makers for me. Typical power is around 150 Watts input (about 1/5 HP). Wing span ranges from 46 to 78 inches (1.2 to 2m). Below is my lastest plane. It’s called the Fred’s Special, in honour of the designer’s dog (named Fred). It’s a medium-performance sport plane, and can do loops, rolls, hammerhead stalls, and stuff like that (I’m not that good at it yet). It also flies quite fast (up to around 40mph) and is a bit more of a challenge to fly than my glider(s) (see below). Fred’s Special, designed by Vernon Williams. I built this plane, from scratch, using plans from a magazine article (Model Airplane News). Like all of my planes, this one is built almost entirely from balsa wood, and covered with a heat-shrinkable plastic film. Wing span is 46.5". Weight is around 51oz. 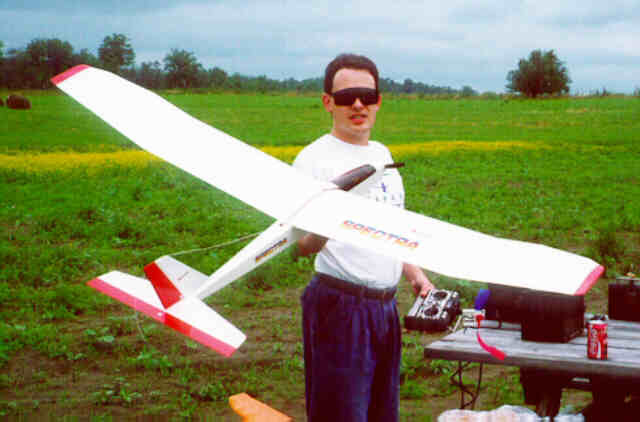 Power is a Graupner Speed 600 8.4V, a home-made high-rate speed controller, an 8×4.5" folding propeller, and a 7-cell 1400SCR battery. My Gentle Lady after suffering a control-reversal problem. To the right is my first airplane. At the time of the photo, it was a glider (it had no motor, and was launched by means of a 300 foot long sling shot). This is the plane I took the various aerial photos (see below) from. The plane is a Carl Goldberg Gentle Lady. Wing span is 2 metres. Weight is around 24oz. I have since modified it for electric power, which has raised the weight to 47oz. Power is a Great Planes Goldfire motor, a home-made on/off controller, an 8×4.5" folding propeller, and a 6-cell 1400SCR battery. The photo shows what can happen if you accidentally hit the control reversing switch on the transmitter while launching the plane. The Gentle Lady is no more. On June 16, 1996, this plane crashed. I was doing some aerial photography with it, and it suddenly went haywire. 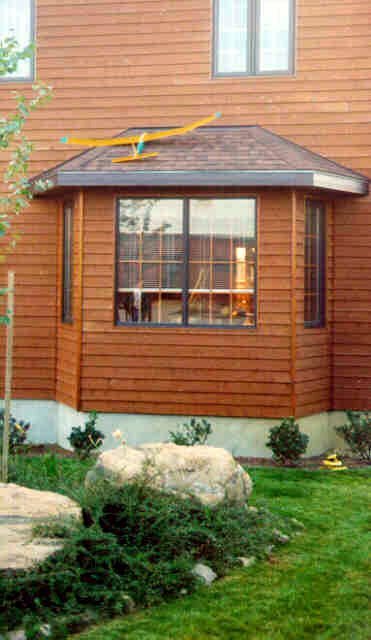 It went into a spiral dive and hit a cottage roof (no damage was done to the cottage). Analysis of the wreckage suggests that the crash was caused by corrosion in the negative lead between the receiver and battery (the same crud you get on the negative terminal of your car battery). 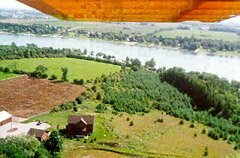 A view of our place, looking southwest, while circling to lose altitude and land. Looking south over the house and lake. A broken wing rib is visible. 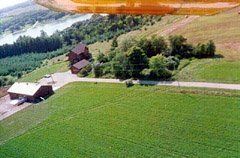 There are more R/C aerial photos in these articles: Summer Aerial Photos of My Farm, Winter Aerial Photos of My Farm, and A Collection of Aerial Photographs. This Great Planes Spectra was the replacement for my Gentle Lady. Next, we have my second plane. It is very similar to the Gentle Lady, but was designed for electric power. It’s the first powered plane I flew. The plane is a Great Planes Spectra. Wing span is 2 metres. Weight is around 58oz (a bit on the heavy side). Power is a Great Planes Goldfire motor, a home-made on/off controller, an 8×4.5" folding propeller, and a 7-cell 1400SCR battery. This photo was taken just before it’s maiden flight (at which time it had an 8×4 fixed propeller). After flying this for a couple of years, I rebuilt it into something lighter and more powerful, the Spectra-V.
A scratch-built scale Piper Cub that never flew. 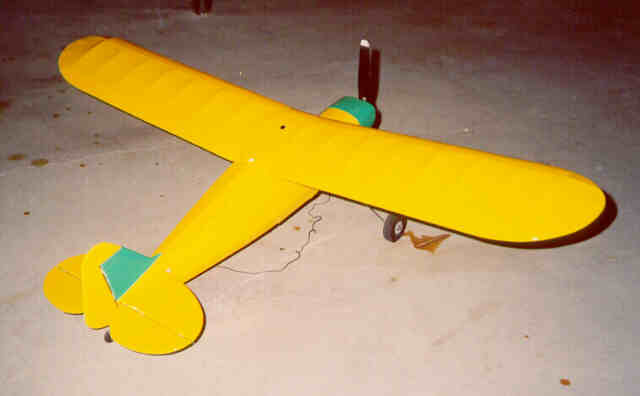 This photo is of a Piper Cub I built in 1993. It never got off the ground due to lack of power (a very high-wind Mabuchi RS-550; I didn’t know much about motors back then) and lack of skill. I crashed it while taxiing around, but I may build a new wing and put in a new motor some day. This plane was scratch built. Wing span is 48". I don’t recall the weight. A Simprop Excel at an EMFSO fun-fly. Here’s me (on the left) and one of my friends discussing/admiring the gentleman’s Simprop Excel. 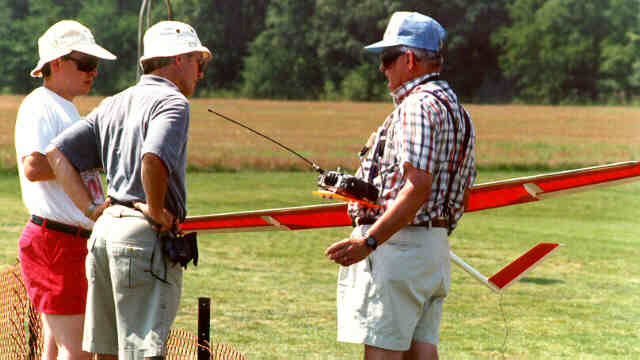 The photo was taken in Halton Hills, at the Electric Model Flyers of Southern Ontario fun-fly.